On my home from work everyday, I pass by the church to say a little prayer of thanks for the blessings I have received for the day. This particular church, the Pope John Paul II Parish Church (formerly The Holy Family Parish) in Eastwood City is a beautiful little church in the middle of a high end residential and business district. The Church's foyer has little prayer booklets and reading materials that are given free to parishioners. Yesterday, I picked up a little reading material which really caught my attention. I am sharing it with you. The Real Meaning of "The Twelve Days of Christmas"
Much more than a haunting melody with nonsensical lyrics, "The Twelve Days of Christmas" was written by the English Jesuits during the 15th century as a catechetical device. I'm sure you have all head the Christmas carol, "The Twelve Days of Christmas." with its haunting melody. The carol dates back to the 15th century and its precise author is unknown. It has generally been assumed to consist of twelve nonsense verses built around a pretty melody. But in a fascinating article in Our Sunday Visitor (12/20/92), Fr. Gilhooley, a chaplain at St. Mary's College, informs us that the carol was written by the English Jesuits of the 16th century as a catechetical device and it is far from filled with non sensical verses. The carol is akin to the apocalyptic literature of Scripture that used to obscure symbols to hide its true meaning from the enemy in time of persecution. To understand the background that gave rise to the carol, let us look briefly at the history of Catholicism in the 16th century England. When Henry VIII was rebuffed by Rome in his bid to divorce Catherine of Aragon to marry Anne Boleyn, he declared himself head of the Church in England replacing the Pope and demanded that all swear an oath of allegiance to him as such. St. Thomas More, the Chancellor of the Realm, the equivalent of the Prime Minister today, refused the oath supporting the elimination of the Pope's authority and Henry had him publicly beheaded. Catholic convents and monasteries were closed and looted. The situation was worse under his son, Edward VI, and better during the short reign of Catherine's daughter, Mary Tudor. She was succeeded by her half sister Elizabeth I, an ardent Protestant, the daughter of Anne Boleyn. The practice of the Catholic faith was banned. Priests were exiled and forbidden under the pain of death from returning or performing the sacraments. It was a desperate, dreadful time. With this as a background we can see the need for secrecy and deception 'The Twelve Days of Christmas" was written to educate the faithful in the doctrines of the faith and yet not be so obvious to the persecutors. The numbers are simply a mnemonic to help Catholics remember some basic facts. "The Twelve Days of Christmas" celebrates the official Christmas season which starts liturgically on Christmas Day and ends twelve days later on the Feast of the Epiphany. "My true love" refers to God and "me" is the individual Catholic. "Twelve lords are leaping" are the twelve basic beliefs of the Catholic Church as outlined in the Apostles Creed. The "Eleven pipers piping" are the eleven Apostles that remained faithful after the treachery of Judas. The "Ten ladies dancing" are the Ten Commandments. The "Nine drummers drumming" are the nine choirs of angels. The "Eight maids a milking" are the Eight Beatitudes. The "Seven swans are swimming" are the Seven Sacraments. The "Six geese are laying" are the 6 days of creation. The "Five Golden Rings" are the first five books of the Old Testament called Torah, which is generally considered the most sacred and important of all the Old Testament. The "Four Calling Birds" are the four Gospels. The "Three French Hens" are the three persons in God. The "Two Turtle Doves" represents the two natures in Jesus - human and divine. The "partridge" is the piece de resistance or Jesus himself and "the pear tree" is the cross. Fr. Edward Dowling is the author of Have You Heard the Good News. Reprinted with permission from the publisher. All rights reserved. As a Catholic, I find this very interesting. I have never heard of this reference before AND I LOVE IT! It makes the song so much more meaningful to me now. What an interesting read!? Who knew the connection between a fun Christmas carol and some history? Thanks for sharing! interesting; I never thought of the song to have some kind of religious connection. What a great article! It's great to learn more about the song! This was an interesting perspective. What a great read. This is good information. I read about this and explain it to my kids every single year. Not having grown up in a church, it is interesting to learn the meaning behind the song I grew up listening to. I love that you shared this, it allowed me to have a different view on the season. How very interesting! I guess you learn something new every day! That is amazing. Thank you, I can't believe such a simply popular song has a much deeper meaning. Did you know that there is a choral piece that's called "The Twelve Days AFTER Christmas?!?" It is such a riot! For example... "the first day after Christmas, my true love and I had a fight. And so I chopped the pear tree down, and burned it just for spite...."
Hope you've watched the Tudors. I heard it's the most accurate in comparison to other "stories" of the Tudors out there. 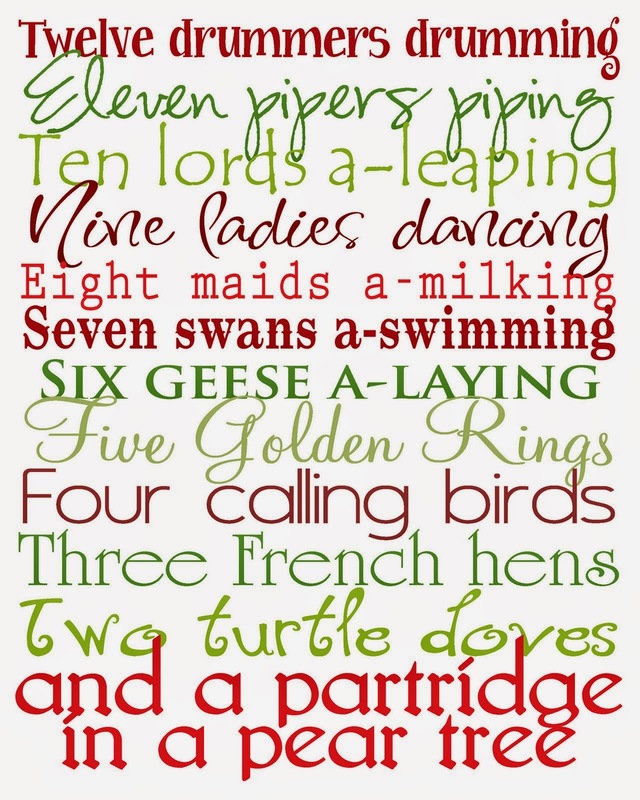 I like all your explanation of the 12 days of Christmas. Very thought provoking. Very cool to learn that there is a background to that song. My kids learned all the verses and haven't stopped singing it. lol. Thanks for sharing. Great to know that sis! Merry Christmas!!! I never knew this. This is such great information! Thanks so much for sharing! I never knew. thanks for sharing...we've been doing a "12 days of Christmas" to a special family...now, it's nice to know it has a more special meaning. I love that Christmas carol but never knew of the real meaning behind the lyrics. How interesting, love all the symbolism. Thanks for a great post, love learning new things!